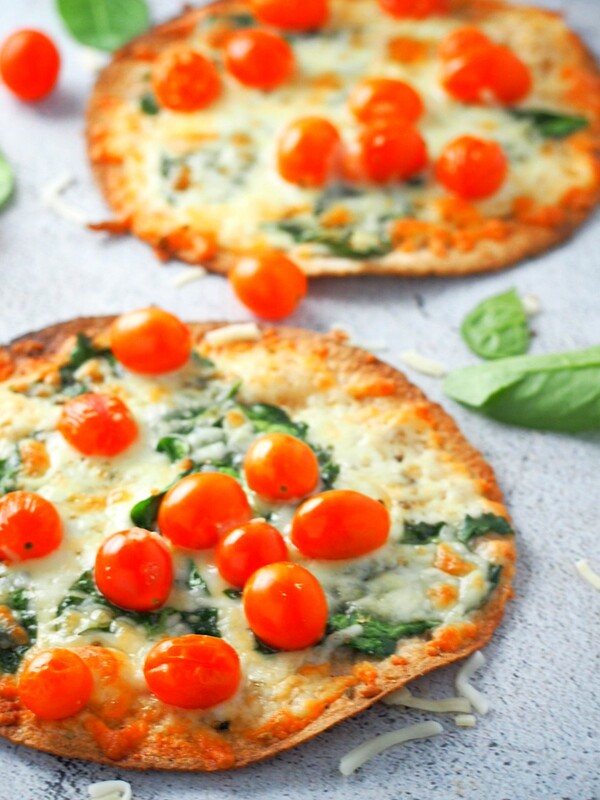 Do you love crisp pizzas? 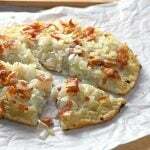 Make these Vegetable Mozzarella Tortilla Pizza for the thinnest and crispest pizzas that you can make in no time. I love making lunches for myself. There is just this simple satisfaction from making something that is exclusively for me from time to time. 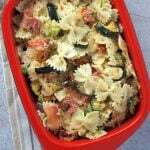 When my toddler is full and asleep, and I have a bit of time, I take the chance to make an easy lunch. Then I get to eat in peace, just me, savoring each bite. 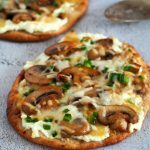 This Vegetable Mozzarella Tortilla Pizza is one of the easy lunches that I make whenever I feel like having something different. My kids won’t eat them, so whenever I make these, they are all for me. 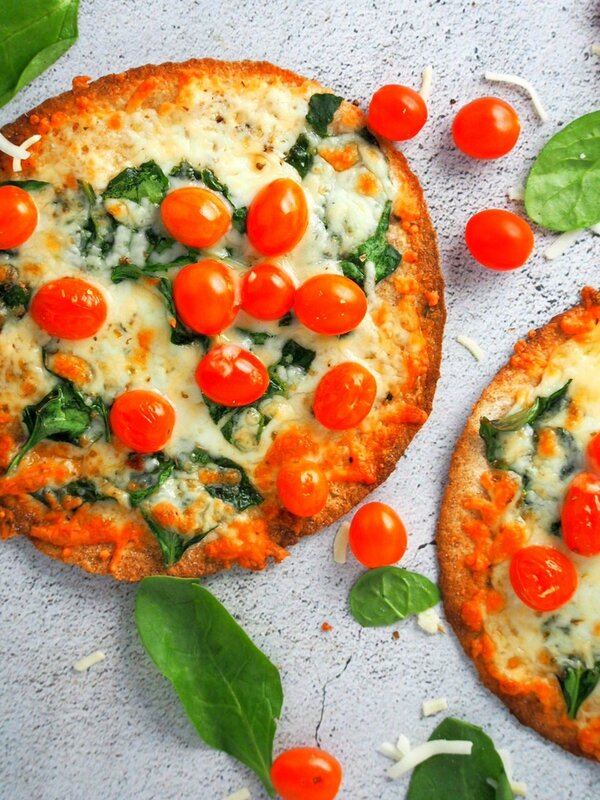 Tortilla pizzas are out of this world crispy. I mean for a pizza, this is the thinnest and crispiest. I especially love mine extra toasted to the point that the edges look like they are starting to burn. That is the kind of crispy that I want. Almost like I am eating chips with a whole lot of toppings. It is also an easy assembly. 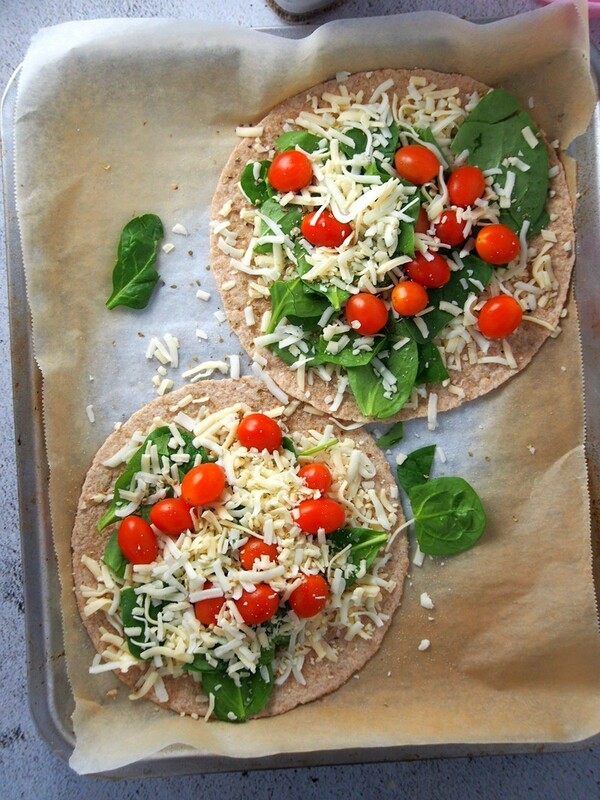 Pile the cheese, spinach and tomatoes over your tortilla and you will have lunch in no time. They bake in 10-12 minutes, although you have to watch for them. Your oven may be different. Mine is almost burnt at the edges by 12 minutes. And one more thing, these are best eaten while they are fresh from the oven. That thin and crisp baked tortilla crust seals the deal. 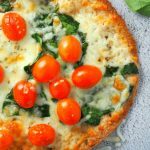 Then add to that the wilted spinach, the bursting tomatoes and the cheese, yes the cheese, that are melty and stringy in the middle and crispy and salty along the edges. 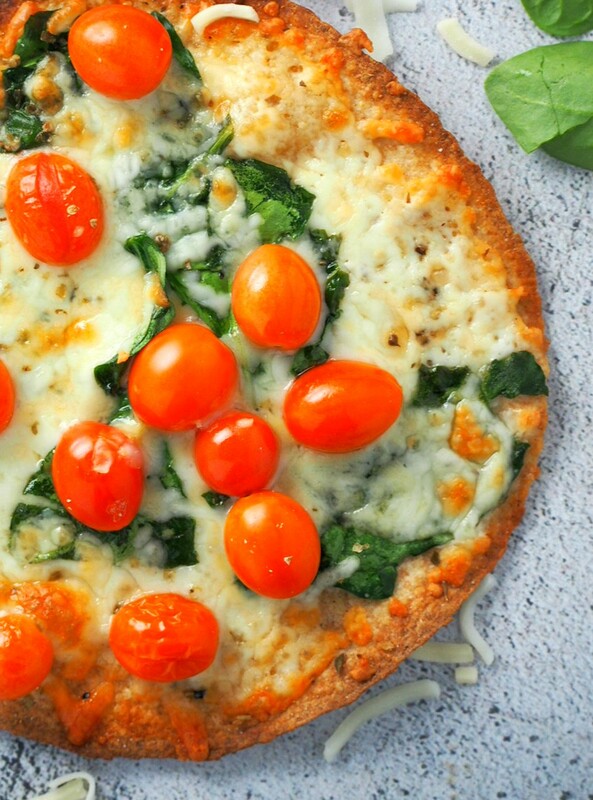 Do you want a crisp and light pizza? 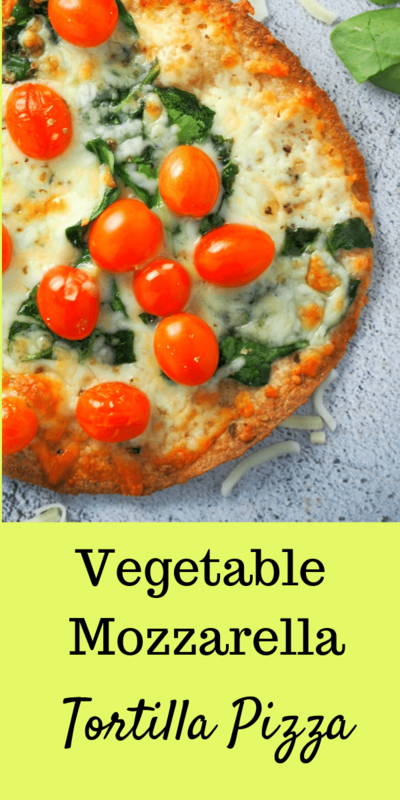 Make these Vegetable Mozzarella Tortilla Pizza for the thinnest and most crispy crust and you have lunch that is done in no time. Preheat oven to 425 F. Brush the tortillas with olive oil. 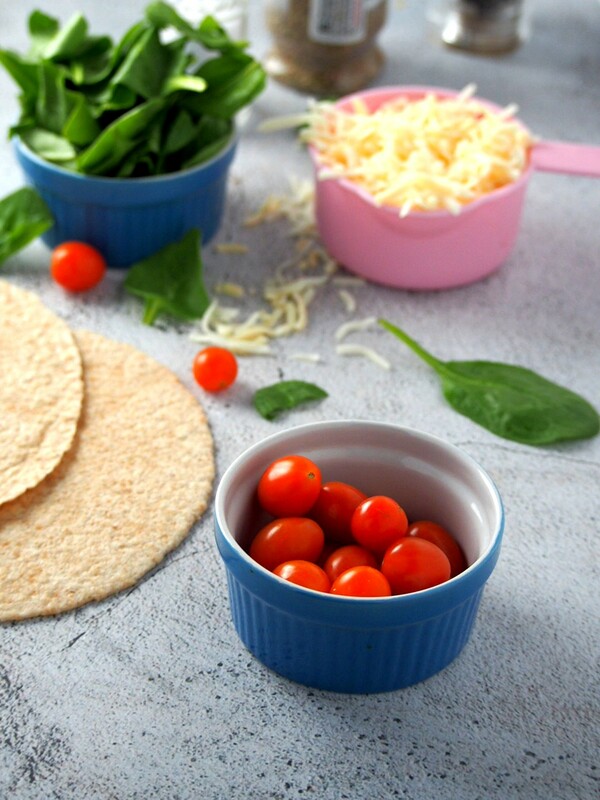 Sprinkle a pinch of salt and pepper to both tortillas. Sprinkle 1/2 of the cheese to both tortillas. Top with spinach. Arrange the tomatoes on top. Sprinkle the oregano. Finally, sprinkle the cheese over everything. If you prefer, you can add a pinch of salt and pepper here. Spray one quick spritz of cooking oil spray to both pizzas and bake for 10-12 minutes or until the cheese is melted and bubbly. 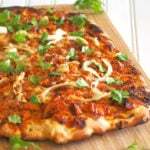 Ovens vary so watch your pizzas closely around 8-10 minutes.